I love the last page of the medieval book. 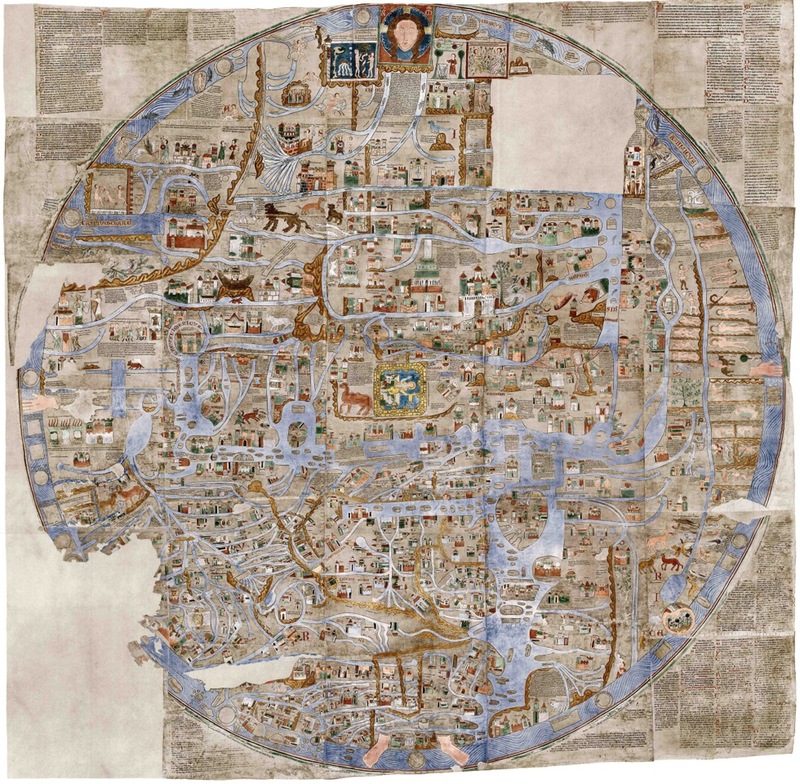 Not because it means that my research of a particular manuscript is almost completed, but because the last page often provides information pertaining to the origins of the object – information not normally found elsewhere in the manuscript. This post, which discusses some of this information, is devoted to the last text page of a manuscript as well as the last physical page of the book – which are, perhaps surprisingly, not usually the same thing. The last page of the text was a podium where the scribe could state information about himself and the circumstances of the book’s production. While few scribes seized this opportunity (about one in seven do say something), such added information, collected in what we call a “colophon”, can enrich our knowledge of a manuscript considerably. Some colophons provide a glance into the reality of the scriptorium or urban workshop, where a scribe toils over a piece of parchment. Well known are colophons that state such cries as “Please give me a drink!” or “Let my right hand be free from pain!” (see Fig. 1 and this MedievalFragments post). 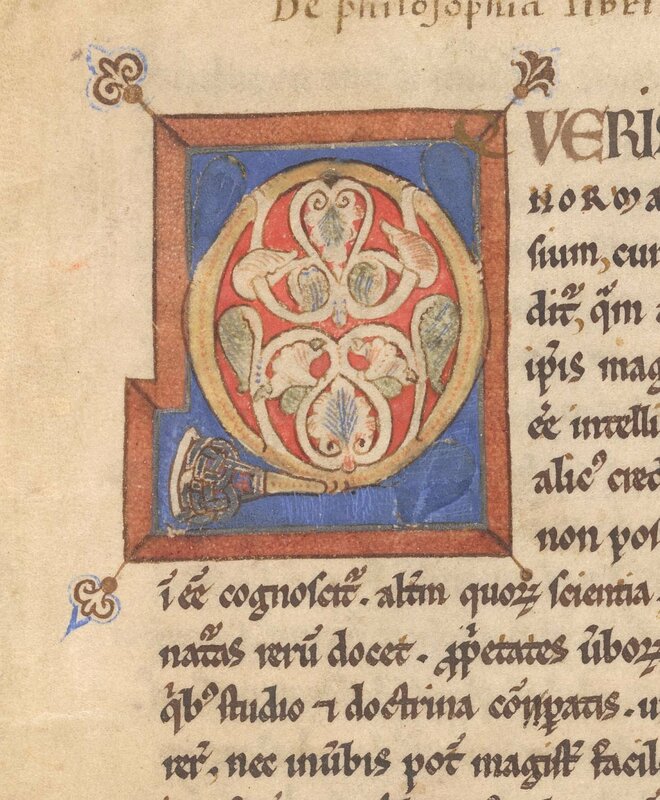 More telling are colophons where a scribe lifts the veil and allows us to peek into his or her working space. The Paris artisan Herneis states on the last page of a book he copied: “If someone else would like such a handsome book, come and look me up in Paris, across from the Notre Dame cathedral” (see Fig. 2 and this MedievalFragments post). There are other cases where a commercial scribe advertises his work. One from mid-fifteenth-century Holland copied the same book up to eight times (the historical books of the Old Testament), showing that his labor is a commercial enterprise. At the end of one of these he writes: “If there is somebody who would like a copy of the New Testament, I would be happy to provide it for payment, because it is beautiful” (Utrecht, Universiteitsbibliotheek, MS 1006, fol. 455r). As exciting as these examples are, the really important colophons are those that read like a title page. 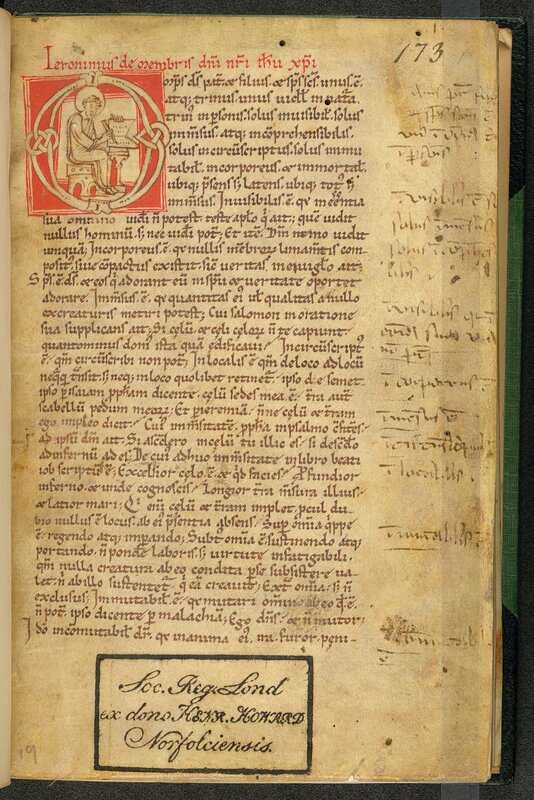 The colophon in Leiden, Universiteitsbibliotheek, BPL MS 2541 is an example of a particularly rich source of information about how the manuscript came to be. The colophon on the last page states: “Pray for the person who made this book, which was completed in 1484 in the city of Maaseik, where we were taking refuge after our convent had burned down” (Fig. 3). These few lines provide a wealth of information, most importantly when and where the book was made, but even something extra about the life (and suffering) of the scribe, who recently lost her home in a fire. The second kind of last page that this post highlights is the actual last page of the book. As you can see in Fig. 3, the end of the last page sometimes coincides with the end of the book, or at least with the original medieval part of it. What also happens, quite frequently, in fact, is that the last text page is followed by one or more medieval flyleaves. 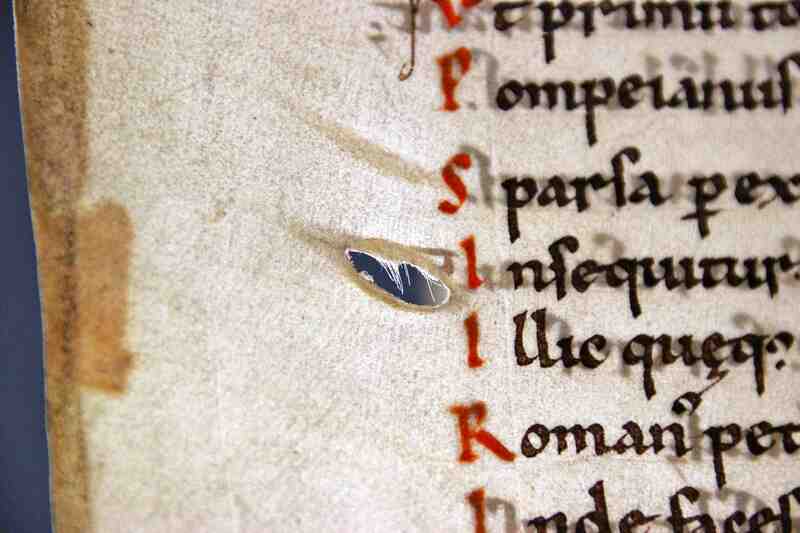 These are often the remaining blank leaves of a last quire, which were left in place as an extra layer of protection. Flyleaves could also be added, usually in the form of a bifolium that was fixed in between the last quire and the board, to which half of the bifolium was appended as a pastedown. 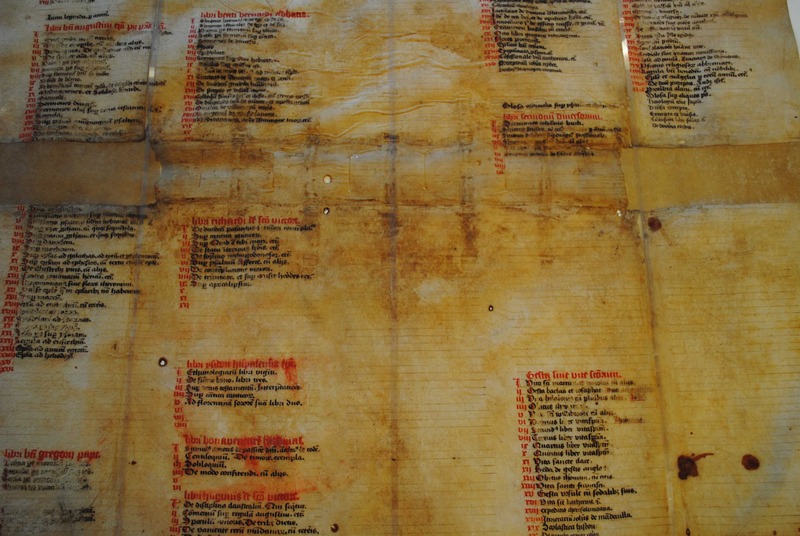 The empty flyleaf – the actual last page of the medieval book – is usually a feast to look at. It was the ideal location to test your pen, to doodle on, or to add informal notes. Some librarians favoured putting the title of the book on the last page, as in Fig. 4, where the librarian wrote “Paterius de opusculis sancta Gregorii” in a book filled with excerpts from works by Gregory the Great. Far more entertaining (for us) are, of course, the famous doodles that were frequently placed on flyleaves. Testing the pen was a common occurrence, given that the quill had to be cut several times per day. Scribes turned to the last page of a nearby book to jot short sentences of doodle little drawings to see if the nib’s cut was in order. Interestingly, some of these trials seem to combine testing the pen and trying out decorative elements. A good example of this is the page shown in Fig. 5. 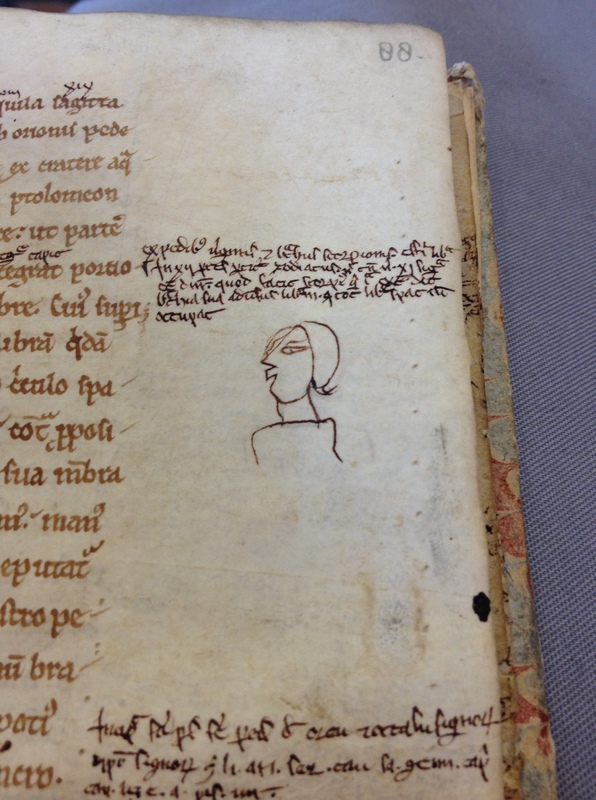 While testing his pen, the scribe of these lovely doodles actually produced shapes that would not be out of place on an actual text page as decoration. It is almost as if he was refining a skill while also dealing with the nib of his pen. After all, a nib could be tested with just a few squiggly lines. Thus the last page of the book becomes a test ground for artistic creations: it makes for an attractive last thing to glance at before closing the book. Note: This was originally posted as my last contribution to the collaborative research blog MedievalFragments. 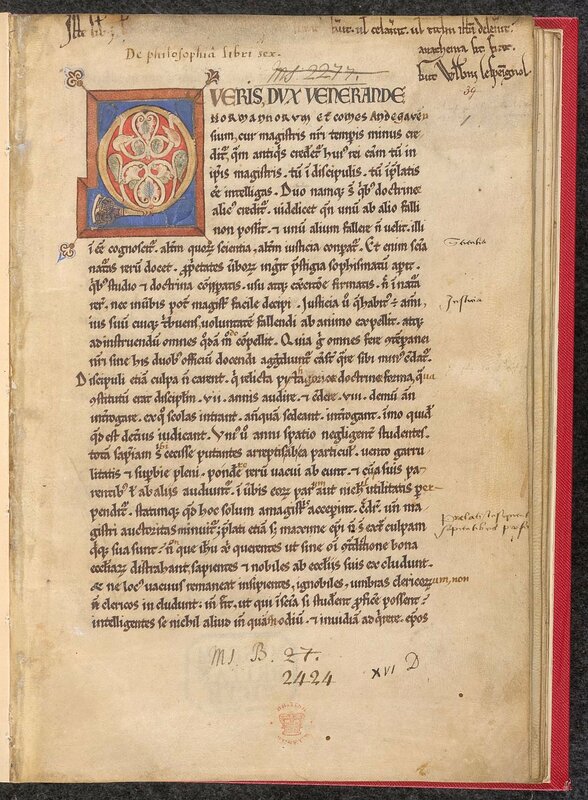 A companion piece on “The First Page of the Medieval Book” can be read here. It is the evening of Thursday 27 February, 2014, and at the moment I am sitting in The White Horse being stared at by Inspector Morse, who frequented this pub back in the day – and who seems to have left a portrait behind every time he did. 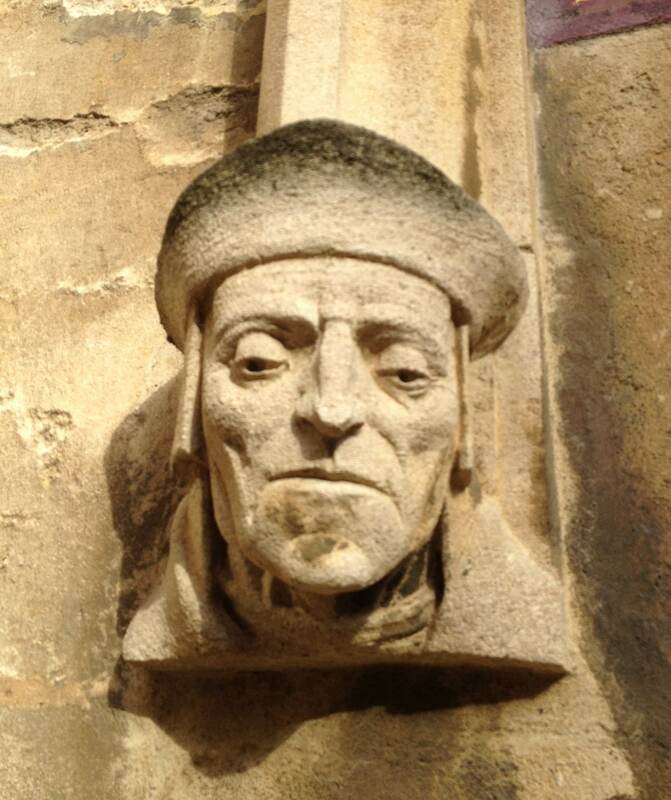 When I look out the window I can see the Bodleian Library, that treasure trove of medieval books. For the past week this is where I have been: Oxford, more precisely Corpus Christi College. Invited to be the 2014 E.A. Lowe Lecturer in Palaeography, I came to the college for a week to give lectures on medieval script. I learned a lot over the past week, both from the audience’s responses and through discussions with colleagues, both inside and outside Corpus Christi College – a most welcoming and hospitable community. 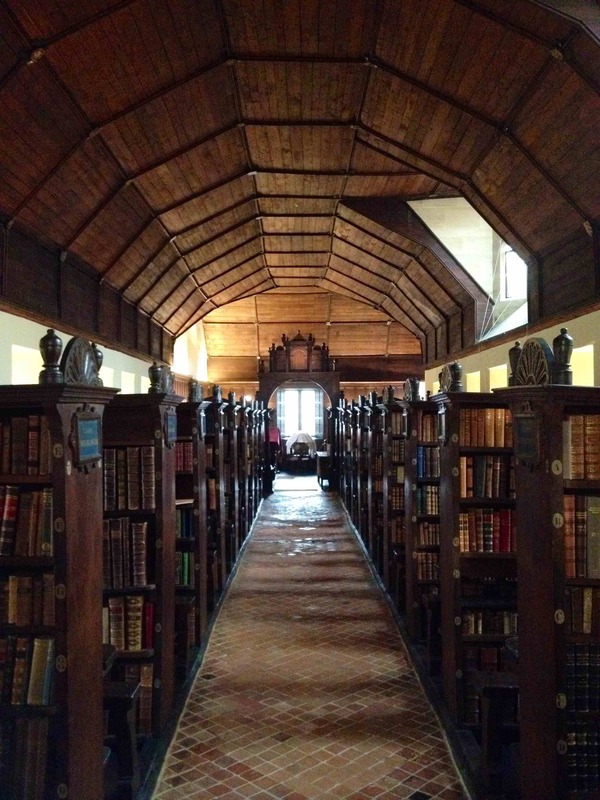 This blog has everything to do with medieval manuscripts, but it is more personal than usual, if you forgive me: I thought I’d give a sense of what it entails, doing lectures in a historical place like this. So here is my week of being part of a stimulating academic world. I arrived in Oxford last Thursday afternoon, just in time to hear @WillNoel do the annual McKenzie Lecture in bibliography in St Cross College, titled “Bibliography in Bits”. Will, Twitter celebrity par excellence, is a well-known proponent of Open Access and making digital data available for all to download and use. (“For free!” he would add to that in a loud voice.) He talked about digital surrogates of medieval books: how a manuscript’s digital representation is its own entity, how it exists – is – in its own right. He showed how a digital manuscript is a resource that teaches us things the material object itself may not reveal. His lecture (and the dinner that followed) formed a great start of my week here. It would also be the last thing I would do – until now, sitting in this pub – without a certain amount of pressure. That pressure was not just generated by the venue, but also by the fact that the data at the heart of my lectures had just been harvested – with the indispensable help of my Research Assistant, RV. The paint of my lectures still wet, much of my free time was filled with going through my data and deducing how to expand the scope of my papers with their help. 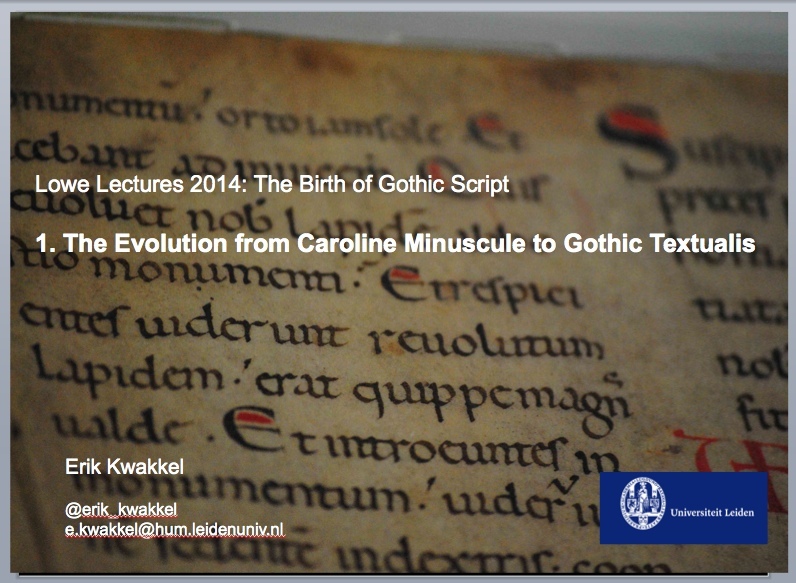 My three lectures aimed to show how the major book script of the Early Middle Ages (Caroline Minuscule, in use from c. 800 to c. 1100) morphed into the major book script of the Later Middle Ages (Littera Textualis, or Gothic script, used from c. 1200 to c. 1600). It’s a great topic because the century in between the two is filled with experimentation by scribes, of mixing older and newer features, and of fights for dominance between opposing letter shapes. My approach was threefold. First, finding a way to describe in objective terms what the actual difference is between the letter shapes in the two scripts. Second, registering in a database whether scribes in different ages and geographical areas preferred the Caroline or Gothic presentation of a letter. Third, translating this data into graphs that provide insight into the transformation from the one script into the other. Each step of my research came with challenges and limitations, but also with opportunities to advance our knowledge. So, here we are, on the Friday: my first lecture. It focuses on how the transitional script from the Long Twelfth Century evolved over time. The theater is filling up nicely (about 75 people have come) and I start to do my thing. I discuss the method for about twenty minutes and then dive into the paleographical depths of the complex hybrid script. Highlighting differences between letter shapes I begin to carve out an objectified description of the road between Caroline and Gothic, focusing not on the overall impression but on hard, measurable features. I challenge the traditional temporal boundaries of the two scripts and feel brave enough to query, at the end of the lecture, whether we ought to perhaps abolish our notion of Caroline and Gothic being different scripts. Would it not be better to regard them as different expressions of the same writing system? My data certainly backed up this provocative idea. After the lecture a dinner was organized in the founder’s room of Corpus Christi Corpus: a great end of my first performance. Then came the weekend, which I spent with family just outside Oxford – walks, pubs, and a newspaper on Sunday. 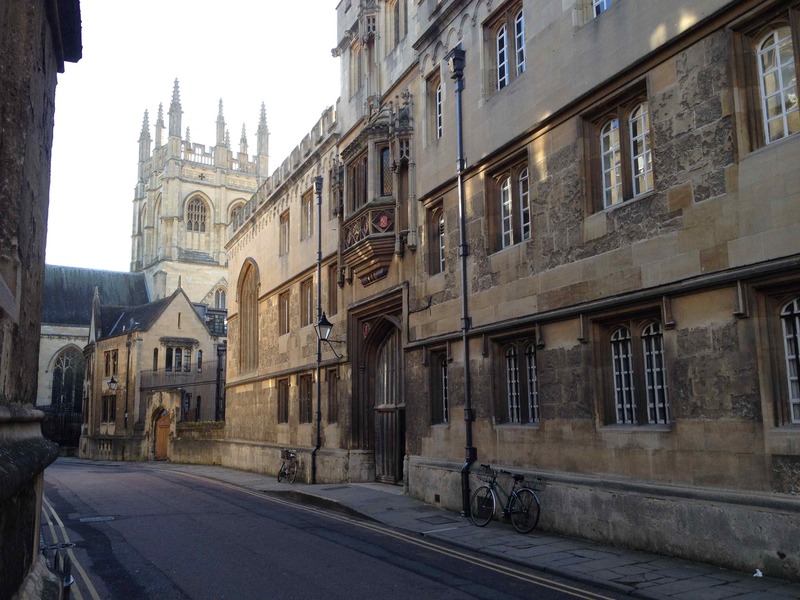 On Monday I did an extra-curricular masterclass for the Centre for the Study of the Book, which runs under auspices of The Bodleian Libraries (here). It had been arranged only a few weeks earlier, within half an hour, and entirely through Twitter messages between me and @DanielWakelin1 – medieval books are so modern! 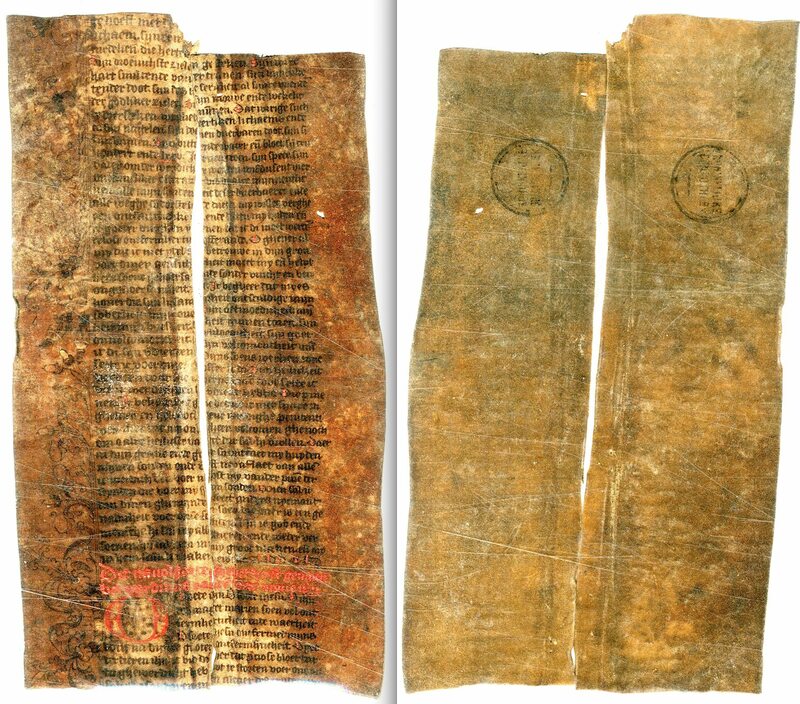 In a seminar room filled with graduate students, faculty and nine medieval manuscripts I talked about two unusual book types: the elegantly tall and narrow holsterbook, and the off-cut manuscript, which is made from recycled strips of parchment. The students had picked out a selection of specimens from the Bodleian Library, adding to the class’s hands-on character. In the afternoon the Fellow Librarian of Merton College gave me a private tour through their medieval library, which is Britain’s oldest surviving library designed for use by scholars (I blogged about it here). Then came Tuesday and my second Lowe Lecture. Having done temporal development last Friday, it made sense to focus on the enormous regional variation in the transformation from Caroline to Gothic. When you place a manuscript from Germany next to one from France you can sense that they are not equally advanced, but with a new tool I developed I could support such intuitive verdicts with a number. 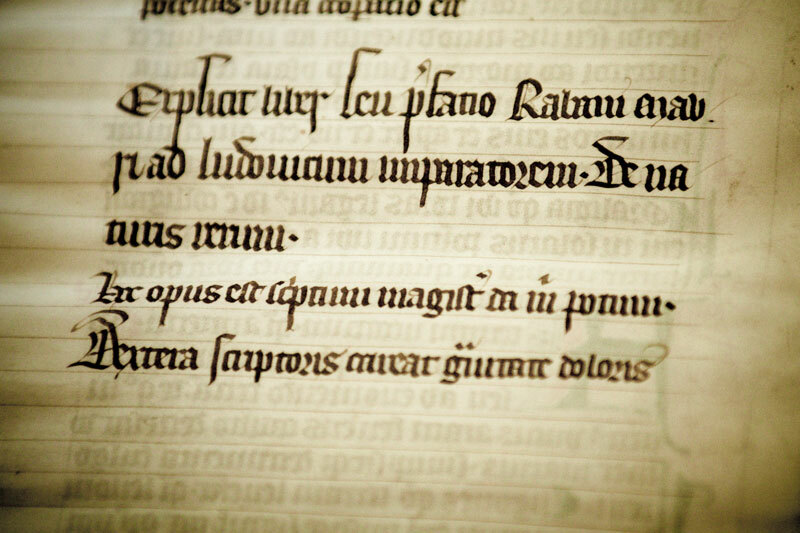 I introduced the notion of Gothic Weight, which measures the “Gothicness” of a script written between 1075 and 1225. It gives a value to each of the thirty or so features I track in my database: 2 points for Gothic, 0 points for Caroline and 1 point if the script trait in question is presented in a mixed form – meaning that the scribe uses both Caroline and Gothic on the same page. When the points are added up, you end up with one number representing how advanced or behind an individual scribe was with respect to his handwriting. It means you can compare a German and a French manuscript objectively, as well as comparing Germany and France as a whole (by taking the average Gothic Weight), or even map the increase of Gothiness over time within European regions. Wednesday and Thursday were filled with working hard on the third paper, in which I aimed to show how Gothic script evolved not over time or in different regions, but as a novelty that was passed on to new generations of scribes. How did idiosyncrasy turn into new norm? My database did not provide an answer to this question, but using my data in combination with broader questions I could explore the very difficult question of a script’s dissemination – albeit without providing a definitive answer. The paper mainly focused on training, as I figured this was the moment when a new script feature had the chance to jump to a new user – a novice in a monastery being trained to write for the first time. In fact, such transmission would depend on the person in charge of training novices: if he was modern and advanced, then likely so would his pupils be. The main part of the paper therefore examined two cases where teacher and pupil were found on the same page: the first prompting the latter, monitoring progress, and correcting mistakes. It is exciting research given that you study, in a sense, the “homework” of a medieval scribe. After the lecture I was invited for dinner in St Edmunds Hall and after that I retreated to the White Horse, where I am currently writing this blog. The bell for the last round has just rung, so I must be off – away from this pub and, tomorrow, from Oxford. One last time I will open the medieval gate of Corpus Christi College with my electronic key chain – a contrast that strikes me as a suitable parallel for my week of studying digitally the handwriting of medieval scribes. More information – The full abstracts of my Lowe Lectures are found here. 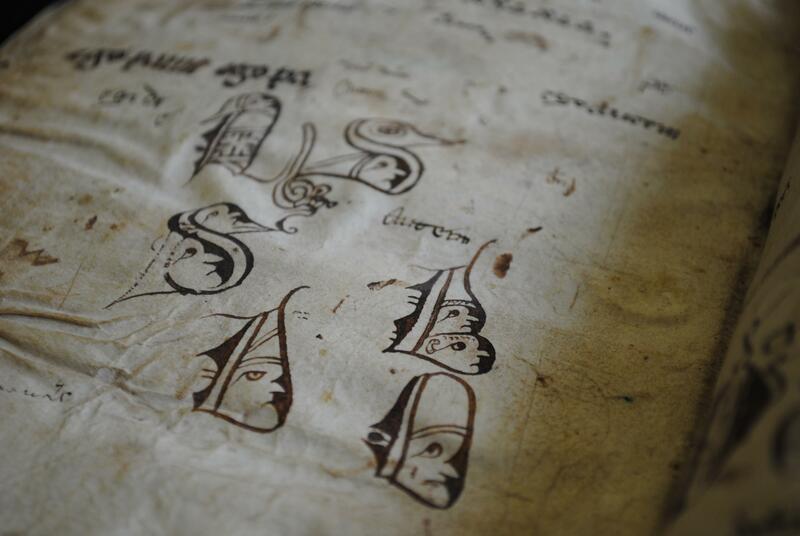 More about my approach to medieval script in this blog about kissing letters. Download this free book if you want to read an article I wrote on mapping script objectively. What you do when you are kept up at night with such an existentialistic query is to consult Google. However, what Google returns does not make me a happy camper. In fact, I am provided with a very broad range of possible answers. First of all, let’s remove the weed, answers that are the result of flawed reasoning. A lot of websites, for example, confuse “book” with “text”. Wiki Answers reports: “the oldest book in the world is the Bible” (here). And Ask.com: “The oldest book in the world is entitled ‘The Instructions of Shurupak'”, which dates from 3000 BCE (here). A book and a text are, of course, very different things: like a hamburger in a bun or your legs in a pair of pants, a book contains a text, but it is not its equivalent. Equally incorrect are websites whose claims are based on the premise that a book is a printed object. Thus the oldest book in the world must surely be the Gutenberg Bible (oldest printed book in the West, from c. 1455) or Buddhism’s Diamond Sutra (oldest printed book in the East, from c. 868), as in this Huffington Post article. No, it’s not. 1. 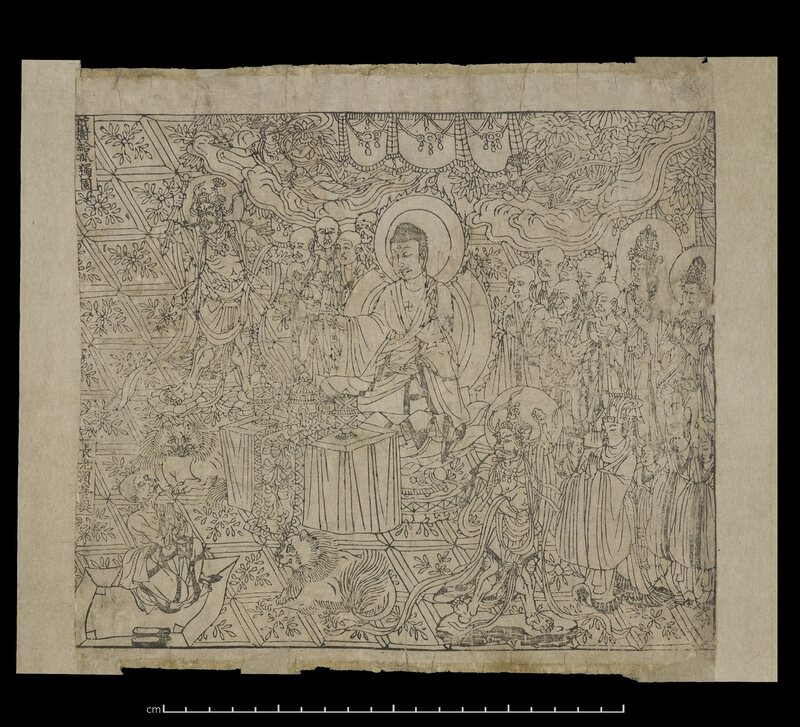 Frontispiece of the Diamond Sutra, printed in China, 11 May 868. More carefully phrased answers can be equally confusing, even when provided by reputable institutions. When the British Library purchased the St Cuthbert Gospel, the seventh-century copy of the Gospel of St John found in St Cuthbert’s coffin when it was opened in 1104, newspapers claimed the library was in possession of “Europe’s oldest book” (see for example here and here). In its press release the British Library qualified its purchase as “the oldest European book to survive fully intact”, which is to say that it survived in its original binding (here). While this nuance is welcome, the claim feels forced – and not just because the press release atypically calls an English book “European”, no doubt to increase the impact of the purchase. 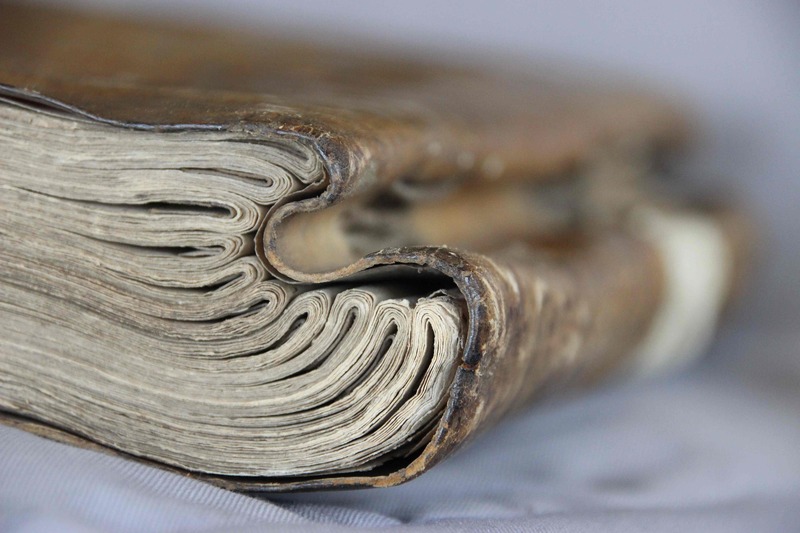 The thing is, many medieval books were designed and used without a binding, which raises the question of whether the binding should even be made part and parcel of the concept “book”. 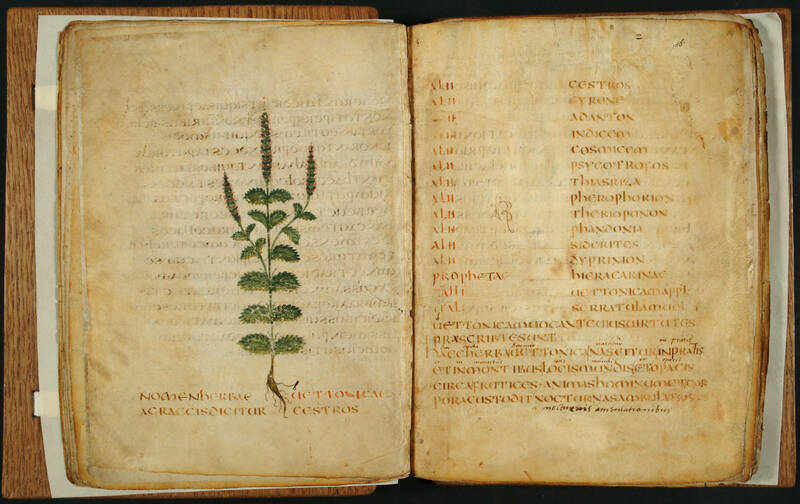 Notably, if bindings are taken out of play there are other books older than the St Cuthbert Gospel, such as the sixth-century herbary right here in Leiden (Pic 2). 2. Leiden, Universiteitsbibliotheek, VLQ MS 9 (Italy, 550-600). The issue of what precisely constitutes a “book” also lies at the heart of another prominent hit in my Google search. Stop the press, the oldest book in the world is an object that consists of six bound sheets of 24-carat gold written in a lost Etruscan language around 600 BC (check out the BBC news item here)! 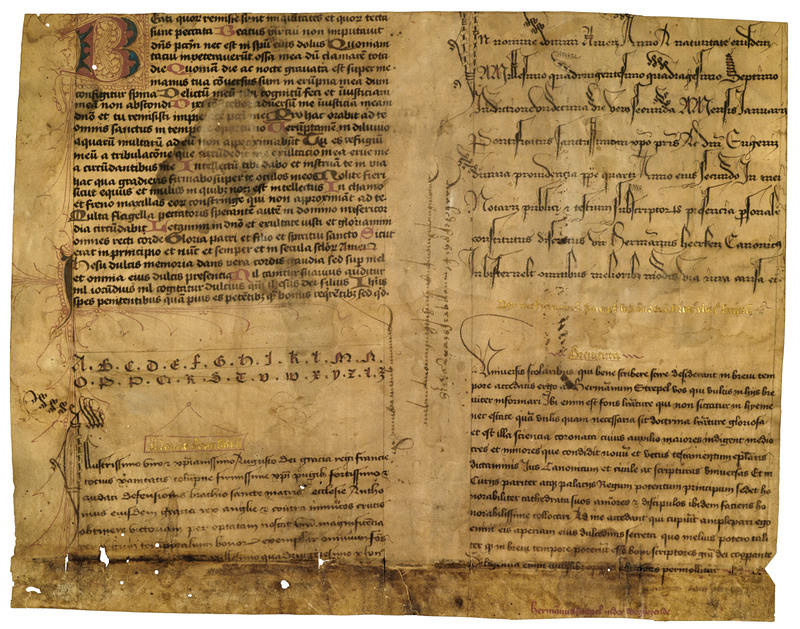 The sheets are “believed to be the oldest comprehensive work involving multiple pages”, according to Bulgaria’s National History Museum in Sofia, where it is kept (Pic 3). Significant is the following assessment of the museum: similar sheets are scattered throughout the world, but those are not linked together, and therefore do not represent a book. 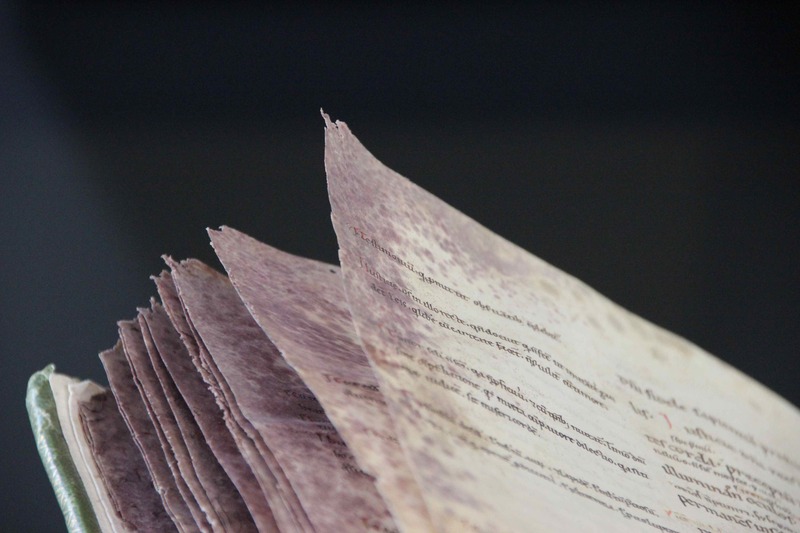 A book, the underlying premise suggests, is an object that consists of multiple leaves bound together. So far so good – we have started our initial descent towards our answer. 3. 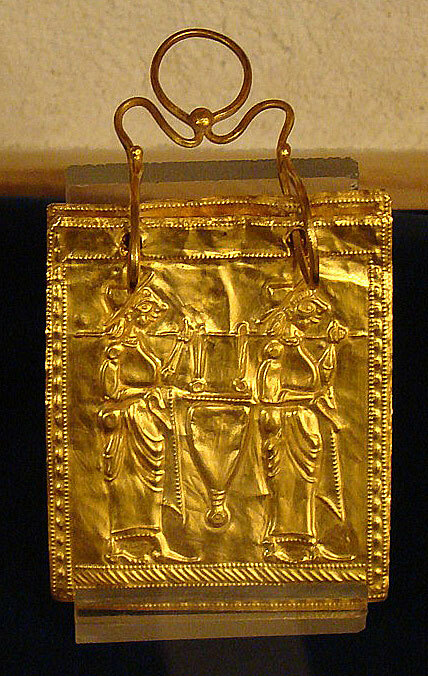 Old Etruscan “book”, made c. 600 BC (Sofia, National History Museum). 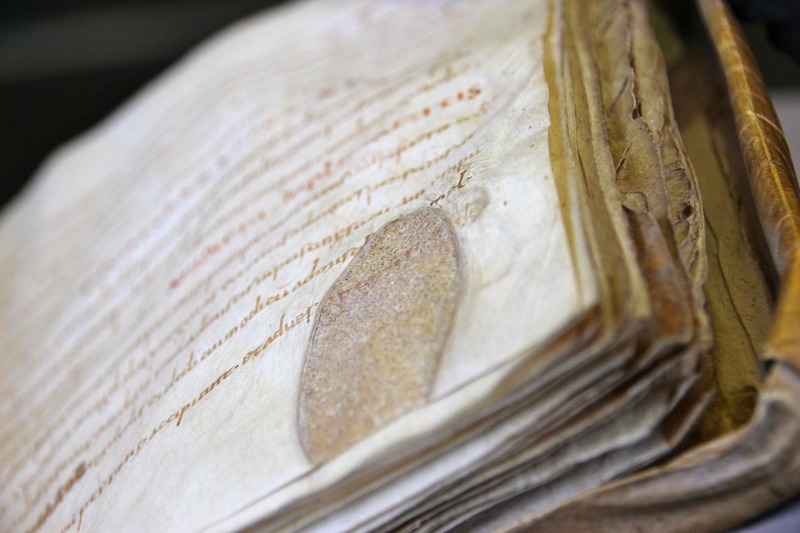 Unfortunately, the shiny Etruscan object cannot be called “the oldest book in the world”. The reason is that it consists of unfolded single sheets (golden plates, actually), which are held together by two rings (as seen in Pic 3). However, the codex (the book before print and therefore the oldest type of real book in the world) is not an object that merely consists of a bunch of leaves. It is, by contrast and definition, built from double leaves: sheets that are folded into quires. Looking for the oldest book, then, we should look among objects made from bendy, foldable writing material: papyrus (made from the plant), parchment (animal skin) and paper. Of these three writing supports papyrus is the oldest. It was roughly used for four kinds of objects: i) Unfolded sheets, used for notes and documentary purposes (example); ii) Rolls, i.e. unfolded sheets that were attached at their short side (example); iii) Book-like objects made up from group of unfolded single sheets (‘singletons’) bound together; iv) Real books made from quires (“codices”).Bingo!The oldest book must be made of papyrus. Which one could it be, however? Our search is made easy by the fact that very few papyrus books of old age survive. 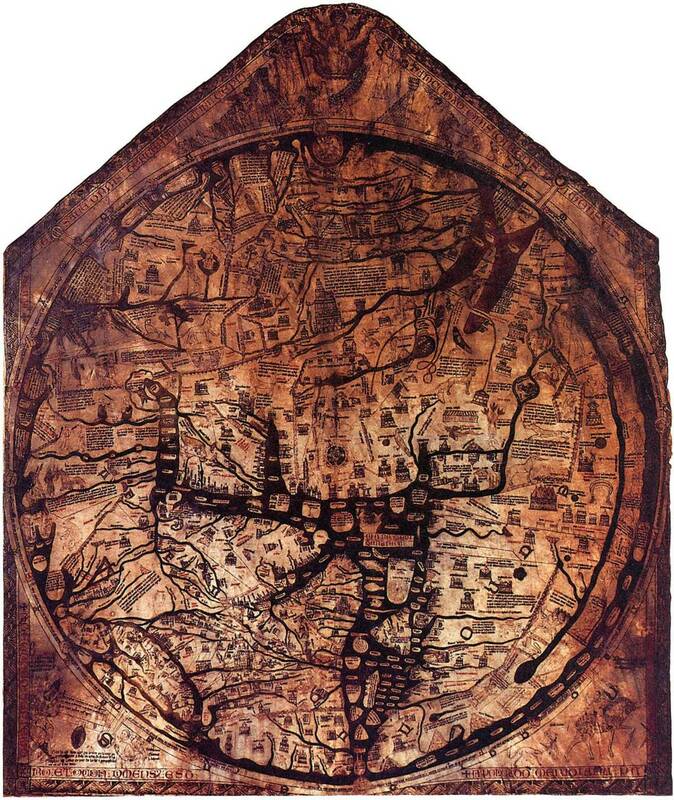 There are some from the seventh or eight century AD (see this one, for example, or this one). 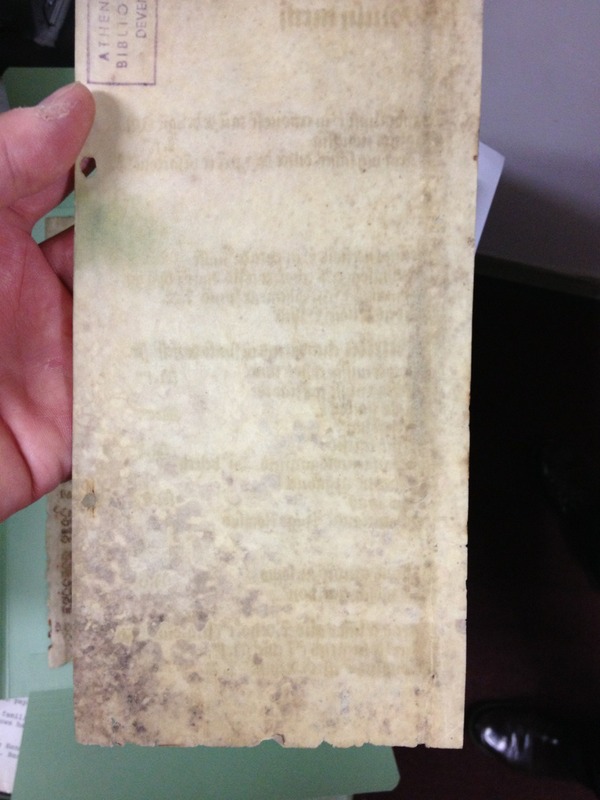 The really old specimens, however, are fragments from once complete sheets (Pic 4). It is their fragmentary nature that constitutes the last – killer – hurdle on our way to the finish line. From a surviving papyrus fragment we can, unfortunately, not deduce – at least as far as I can tell – if it originally belonged to an unfolded (single) leaf or a folded (double) sheet. 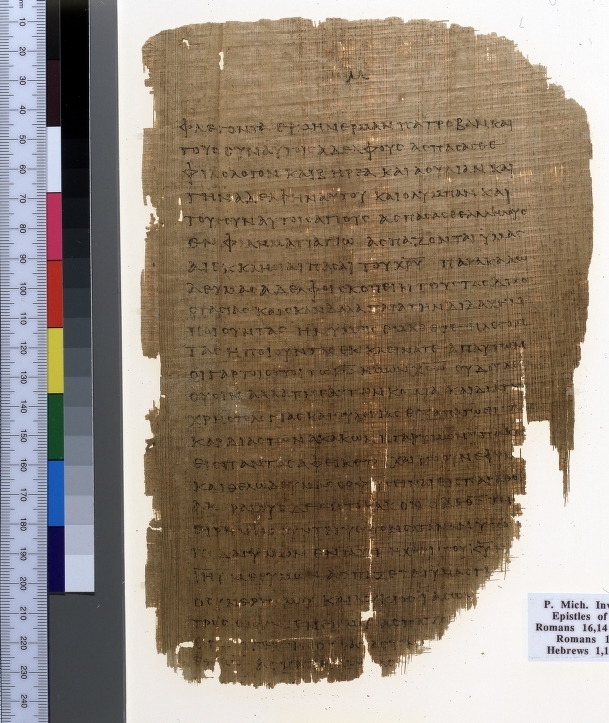 While catalogues often tell you that a papyrus fragment was part of a codex, in other words, that it belonged to a book made from quires (here is an example), we can, in fact, not know for sure if this was the case. Unless it sports a sharp fold, the oldest book in the world will therefore remain hidden in its vault, old but deprived of its prize. 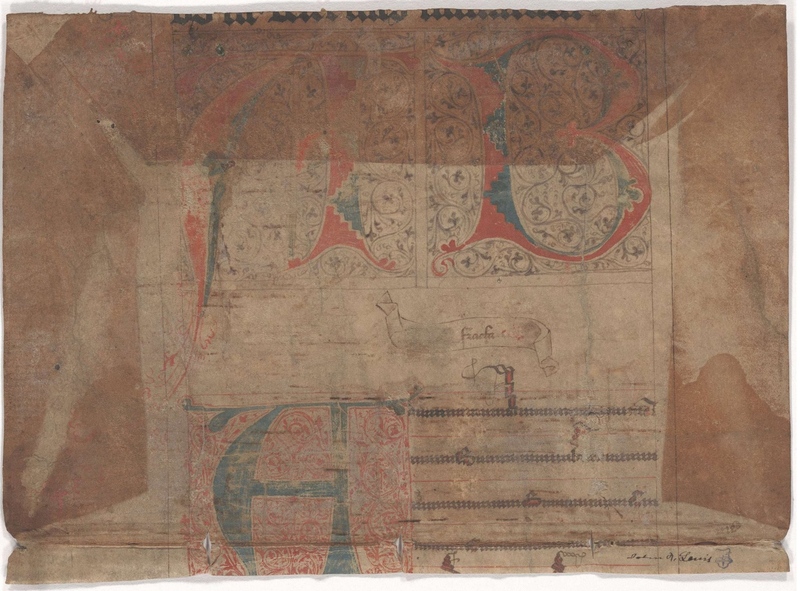 Post-scriptum (30 Dec 2013): a recent British Library blog shows what the bindings of papyrus codices looked like. Read it here. A medieval book was made because an individual wanted to read, own, the text contained on its pages. However, owning a book in the age before print was a luxury. Due to the long production time (easily half a year for a long text) and the materials used (up to c. 1300 the skins of animals) the cost of a book’s production was steep, even if it contained no decoration or miniatures. This is why up to the later Middle Ages book ownership was generally confined to affluent environments, such as religious houses, courts, and the residences of merchants and patricians. 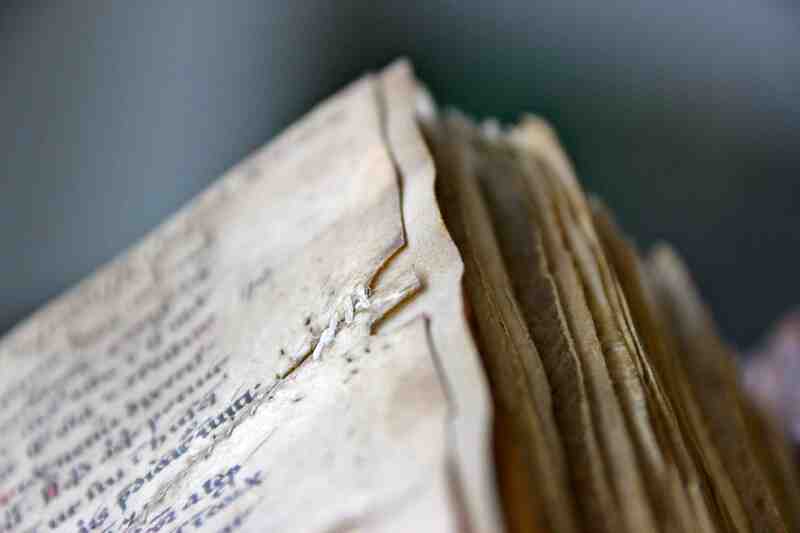 Considering how special it was to own a manuscript, it may seem remarkable that medieval readers wrote in their books. Indeed, their uninvited contributions could be considerable. While in our modern day scribbling on the page is by many perceived as an almost offensive deed, condoned perhaps only when done for study purposes, medieval readers regarded it a normal practice, an integral part of the reading experience. Marginal notes, underscored text, pointing fingers all helped to digest the text and open a dialogue with the author. Thus the pen was as important as reading glasses. 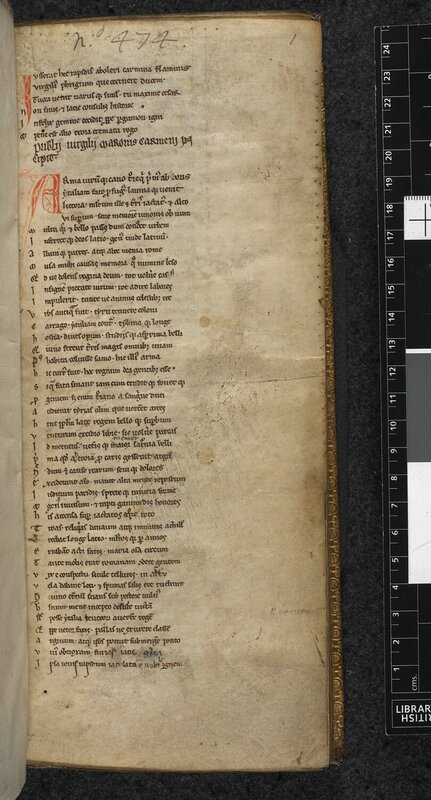 The most common readers’ voices heard on the medieval page concern marginal annotations to the text (Image 1). Reading St Augustine a reader may suddenly remember a relevant passage in the work of another Church Father. With a quick pen action he could opt to place a reference in the margin, perhaps evens with the name of the other authority next to it. He could even quote the referenced text, either by heart or copied from another book. Monks in particular had access to a sizable reference library, a true temptation for the critical reader seeking to interact with the text in front of him. Alternatively, a reader may jot down a clarifying sentence next to a passage that was hard to understand. In Latin books such notes may start with “Id est”(this is, this means). 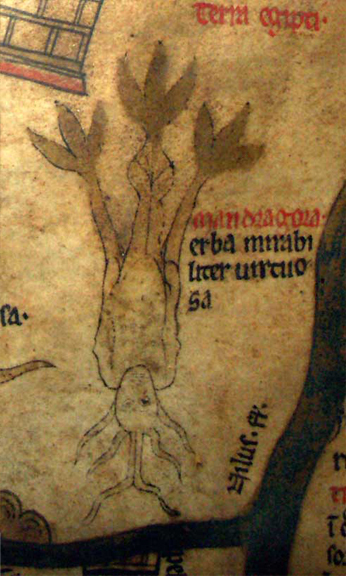 They are particularly common in university textbooks, but they are also frequently encountered in learned books from other environments – including monasteries. Clarifying notes are usually placed in the margin, that inviting ocean of empty space (as much as 50% of the medieval page was margin). Shorter notes were sometimes scribbled in between the lines. More exceptionally, readers drew clarifying schemes to makes sense of the sense (Image 2). Alternatively, a reader may use his pen to highlight important information. He could do so by drawing lines in the margin alongside the text, as we would do today, but there were also more sophisticated means. A particularly attractive one is the pointing finger (Image 3). This well-known signpost comes in different variants. On the one end of the spectrum there is merely the hand with its pointing finger, which is usually extended; on the other end there are hands with elaborated sleeves (like this one), or even those with entire bodies attached to them. A less conspicuous way of pointing out important information was to place the word “nota” (attention) next to it in the margin. The manner in which these signs were executed is highly personal: readers made their own customized pictogram out of the four letters of the word. Sometimes a reader noticed that something he read was terribly wrong, prompting him to dip his quill in the ink pot. He may, for example, expunge the incorrect words by placing dots underneath them and write the correct reading nearby. Scribes often rid the text of copying flaws after they finished their job, but the picky reader may still find plenty to correct. Some got agitated by the mistakes they encountered as they made their way through the book. The individual who read a late-fourteenth century Dutch Gospel Book now in Vienna remarked the following when he was a third-way into the text, having already corrected dozens of mistakes: “These Gospels have been translated poorly; [the translator] did not understand them very well” (Dese evangelien sijn alte matelec gedietscht, diet dede verstont se qualec). (Image 4). This frustrated outcry shows that readers’ corrections did not just concern flaws left behind by the scribe, but also included mistakes that were “baked” into the text from its very conception – when it was first made by the author or translator. They also show how personal (and opinionated!) readers’ remarks may be. There were other reasons to leave personal statements in a book. 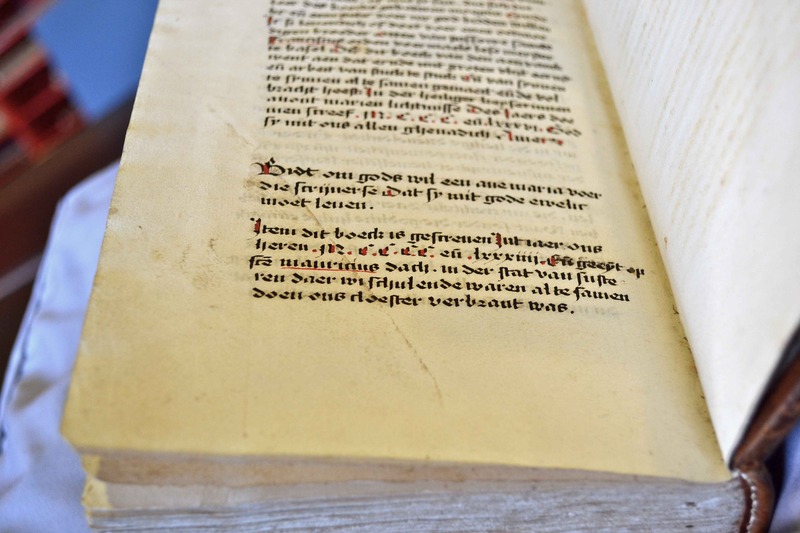 An enjoyable case for those who love medieval book culture is what Hector van Moerdrecht, Carthusian in Utrecht, had to say about two particularly narrow books in the library. In both he jotted on the flyleaf: “This book does not have the required width; it is too narrow and high”. 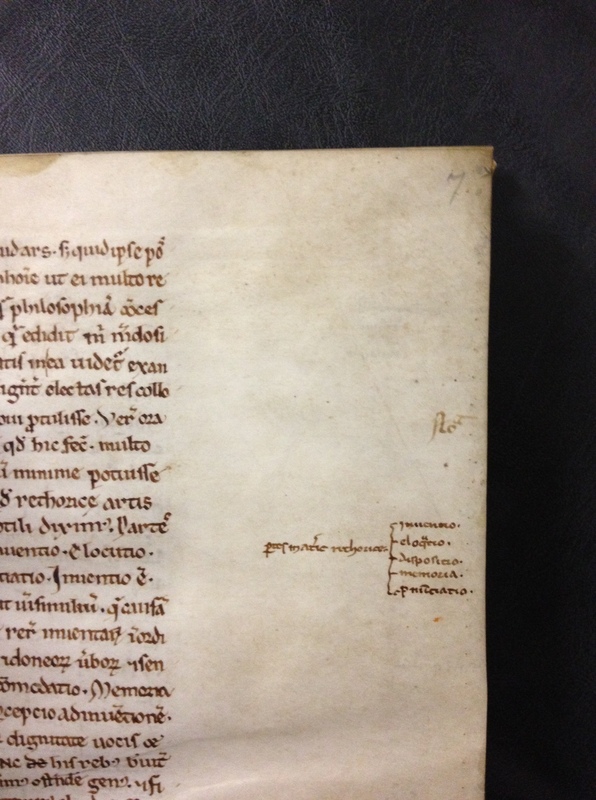 His verdict was correct because the books do break with the rule for medieval page proportions. Van Moerdrecht’s words sound like those of a disappointed reader, or perhaps they were meant to offer an apology to his fellow monks. As the examples above emphasize, Carthusians were keen on presenting text in a “proper” manner. 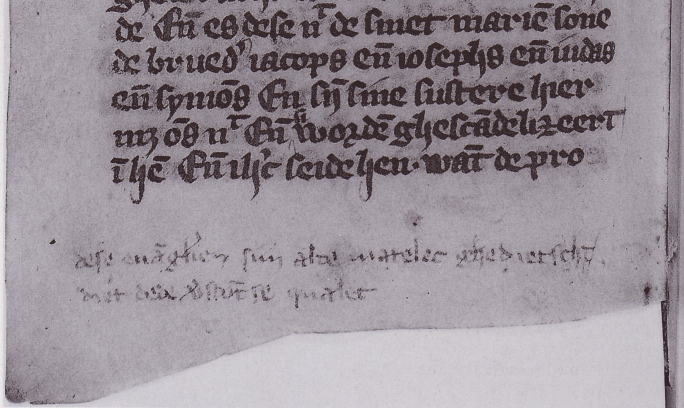 5) Leiden, Universiteitsbibliotheek, VLQ 1 (11th c): “Alter liber habet…”. Then there are, finally, instances where it was necessary to add signposts to the page. 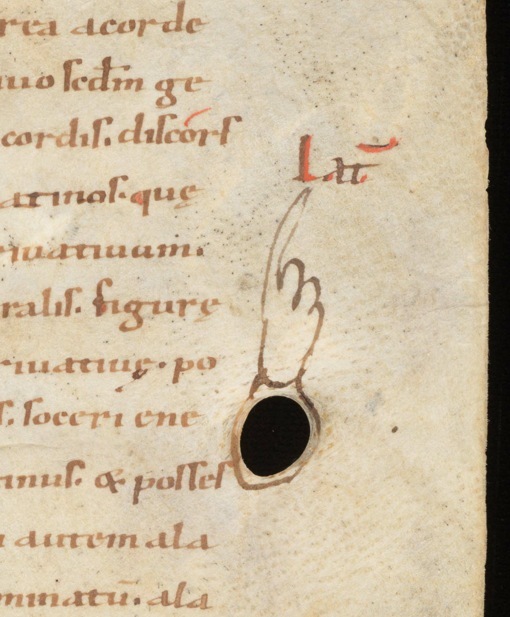 A reader could, for example, point to another relevant text in the same manuscript (“see also further, on page …”). Particularly interesting are references to books in the library that presented alternative readings of a word or a passage. 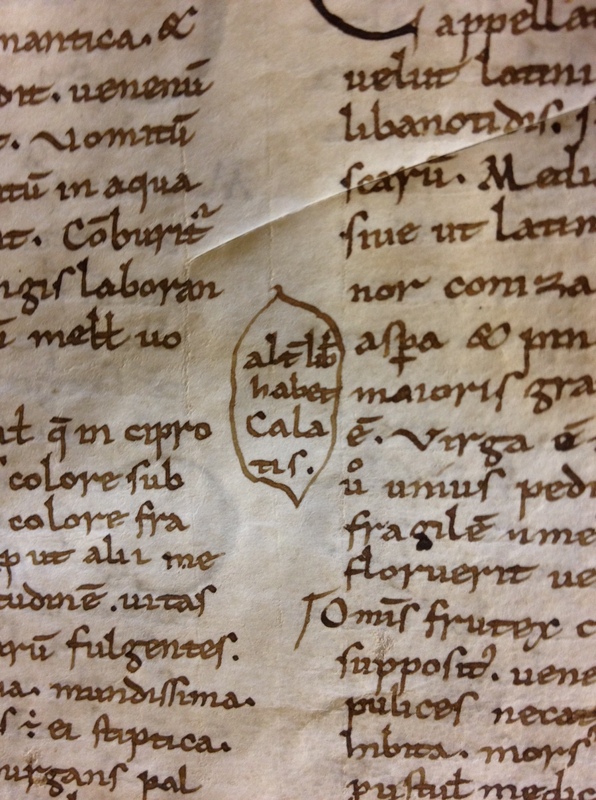 “Alter liber habet calatis” (our other book has “calatis”) we read in the margin of Leiden, Universiteitsbibliotheek, MS VLQ 1, a late-eleventh century copy of Dioscorides’ De materia medica (Image 5). Such a remark suggests that the individual went through the text critically, comparing it, apparently, with a second copy in his vicinity. Indeed, another reader of the same manuscript frequently placed the letter “r” for “require” (check!) 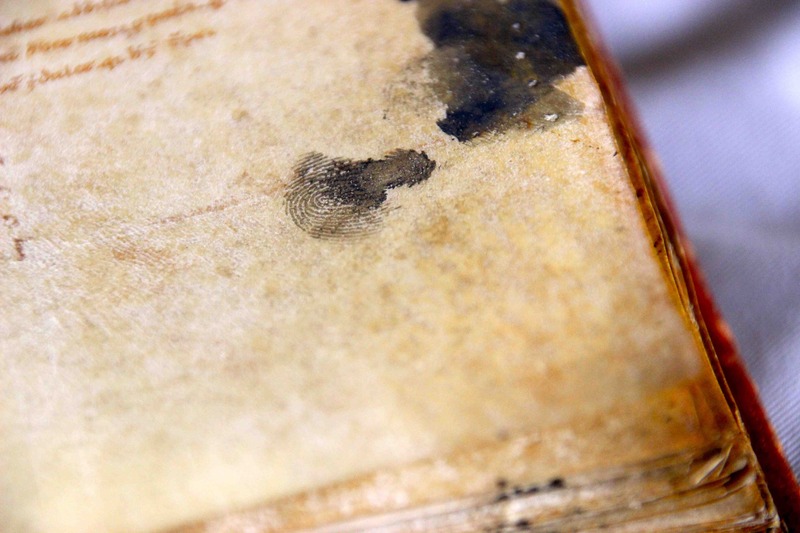 in the margins, showing that he, too, had felt the need to check up on the quality of the text. Looking at the input of readers on the medieval page makes for exciting research as it allows us to look over the shoulder of the very individuals whose books we study. Evidently, many medieval readers read with a pen in their hand, ready and willing to make their mark on the page and in the text. It is remarkable to observe, finally, how the reader did not shy away from exposing himself as a know-it-all, perfectionist, micro manager, or even, in case of the sneer about the poor translation, as a bit of a grump.